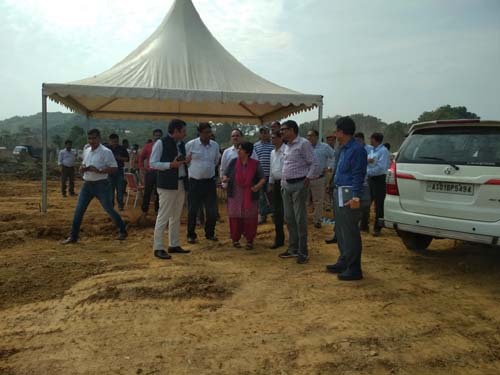 Union Health Secretary Preeti Sudan inspected the All India Institute of Medical Science (AIIMS) site in Guwahati on Sunday and reviewed the progress of work done so far. It may be recalled that Prime Minister Narendra Modi laid the foundation stone of a unit of the Delhi-based All India Institute of Medical Sciences (AIIMS) at Changsari in the year 2017. Instead of conducting the ceremony at the site of the institute to be constructed 26 km away from Guwahati, Modi, who was on a whirlwind tour of the State, did it by pressing a remote from the Sarusajai Stadium in Guwahati. To be constructed at a cost of Rs 1,123 crores as part of the ‘Pradhan Mantri Swasthya Suraksha Yojana’, the unit is expected to be completed within the next four years. It will have a hospital comprising 750 beds, a medical college for 100 MBBS students annually, a nursing college for 60 students each year and 22 super specialty departments including 16 operation theatres. Setting up of the unit at Changsari has been riddled with controversy with people from Raha, located 76 km east from Guwahati, near Nagaon, demanding that the institute be constructed there. The Middle Assam AIIMS Demand Committee had taken up agitational programmes like blocking of the National Highway 37 (NH 37) demanding that the unit be set up at Raha. The committee had also approached the National Green Tribunal (NGT) seeking a ban on setting up of the unit at Changsari on the ground that the area falls in an eco-sensitive zone. In 2016, a youth was killed in police firing in a demonstration at Raha.